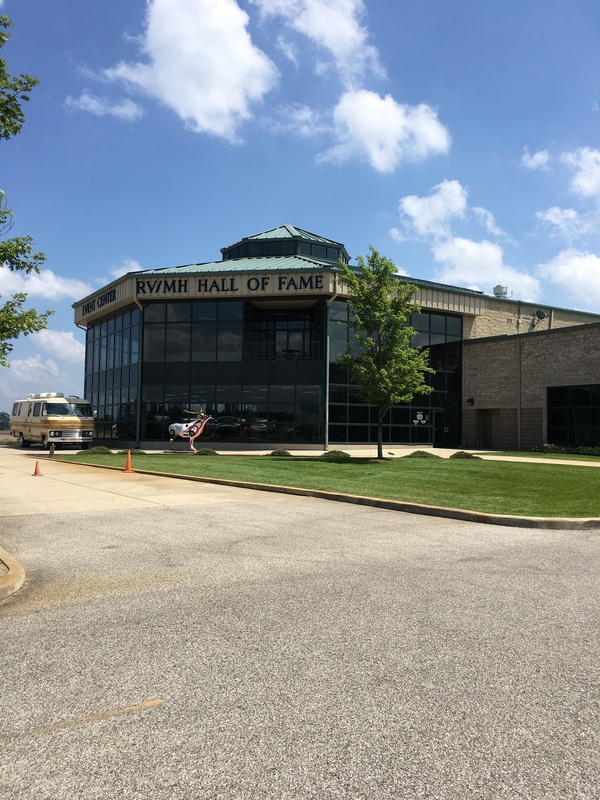 RV/MH Hall of Fame – Let's Go RVing! A day of waiting. Although we did not have a service appointment with Newmar we decided to go anyway to see if we could be worked in. The scheduling office opened at 7:30 and Jerry was right there to put our name on the list. They said they would call in the afternoon to let us know what was available. We also knew we had a problem with our SMI Stay and Play brake system and the home office is in Gary, Indiana about 80 miles from Nappanee so Jerry called this morning to see if we could get in there for service. We know that part of the problem is incorrect installation and we were hoping that they could rectify that. They said they would call! We had planned to go on the 10:00 tour of the Newmar Factory but when we got there it was already full. I’m pretty sure that many of the FMCA attendees left Indianapolis for Nappanee. We decided to be back by 12:30 for the 1:00 tour. 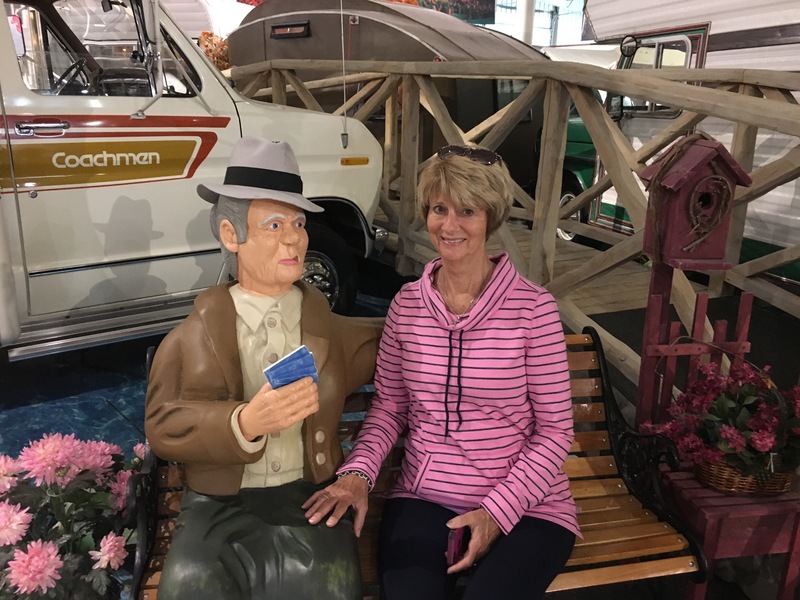 After that with nothing to do we headed out to Elkhart to visit the RV Museum but before we got out of Nappanee we realized that we probably wouldn’t have as much time as we’d like at the museum so we ditched that idea. Really what we had done all morning was ride up and down the Main Street of Nappanee trying to decide what to do with our allotted time! Next stop, Kountry Klub of Newmar. We had talked about joining when we first got our Canyon Star but just never did. We could join now for the pro-rated rate of $45 and get a year and a half. Pretty good deal so we did it. Hopefully we can go to some of the rallies. The International Rally is held the same week-end as the Louisville vs NC State game so that is definitely out. Ughhhhh – football games rule my fall! With extra time to spare and waiting for phone calls we went over to the Newmar lounge so Jerry could get some Internet. In the midst of all of this I’ve gotten a text from Helen Jo saying she had gotten a call from Misty at Cypress Glen saying that Mom is really sick. Both Helen Jo and I were trying to work out some way for her to get to the doctor. Helen Jo is in Alabama and I am in Indiana, a situation that rarely occurs. In fact to the best of memory we have never both been out of state at the same time and seldom are we both out of town simultaneously. Fortunately we were able to get that worked out. We had a quick lunch and then decided to drive on over to the Newmar tour to be assured of getting in. Our guide, Ashley actually came in earlier than 1:00 and took our group because they knew a lot of people would be showing up for the 1:00 tour. Touring Newmar is nothing like touring the Toyota plant in Lexington. There is no automation but a lot of guys working steadily and hard. Newmar puts out eight new units a day but only builds what has either been ordered for a customer or ordered by a dealership for inventory. It was interesting to see the detail that went into each coach, also the quality of materials used was phenomenal. At the end of the tour we got to go in a few units, an Essex, a Dutch Star and a Bay Star. These were all 2018 units as the last 2017 rolled out at the end of June. Next stop, Elkhart for the museum. On the way Jerry got a call from Newmar saying they would pick our coach up at 6:00 tomorrow morning for work. He also got a call from SMI saying we could bring our car in to have the brake system checked. That taken care of we headed on the ‘RV/MH Museum. Since we had visited a similar museum when we were in Texas we were not as impressed as we could have been. The start of the tour had some new units, two Class C’s. I had never been in one before and was pleasantly surprised at how much room they had. It would be good for a single person I think. I also saw a GMC Class B and it was really nice. Along with all the up to date technology it even had a built in wine cooler. Afterward I looked to see how much it cost but never could find a price so I later looked it up on the web and found – nothing! Interesting. Of course there were many old units as well and a lot of pop ups. I really do love RVing and camping but trust me, had I lived in those early days I don’t think it would have been for me. I told Jerry that I guessed I was born at the right time, not too early for the hardships and not too late for the progressive liberals. Two interesting coaches were the one for Charles Lindbergh and one for Mae West. We headed on back to the coach and after a bowl of popcorn and a little nap we had the first real meal we’ve cooked since we’ve been gone and it was good, nothing special just home cooking. A little walk around the campground and brief chats with folks from Oklahoma and we turned in for the night. Knowing we had to get up at 5:00 tomorrow sent us to bed a little early.